CAIRO—Prominent Egyptian scholar Emad Shahin was among more than 120 defendants, including Egypt’s ousted president Mohammed Morsi, sentenced to death Saturday in two separate espionage and jailbreak cases. The sentences were not final and await review by the Grand Mufti, the highest official of religious law, who will offer his advice on the decisions—a practice required by Egyptian law in cases of capital punishment. 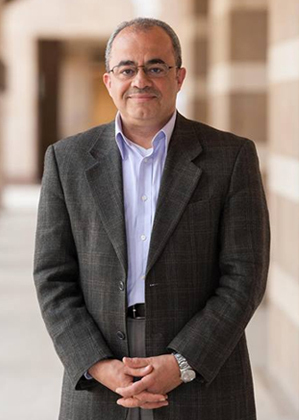 Shahin, who is in the United States, is a visiting professor at Georgetown University, a professor of public policy at the The American University in Cairo and editor-in-chief of The Oxford Encyclopedia of Islam and Politics. After being slapped with charges of “grand espionage”and leading an illegal organization last year, he was convicted in absentia. In a statement Saturday, Shahin said he was falsely charged. He condemned what he described as “sham trials engulfing Egypt since July 2013,” when now-President Abdel Fattah el-Sisi pushed former president Mohammed Morsi out of power. Two of the defendants sentenced to death Saturday were already dead, Shahin added, and one had already been in jail for almost two decades. Shahin was recently a distinguished visiting scholar at Columbia University, and a public policy scholar at the Woodrow Wilson International Center for Scholars in 2014. He was an associate professor at the University of Notre Dame, a visiting associate professor at Harvard University and a faculty affiliate at Harvard’s Kennedy School of Government. His sentencing Saturday comes amid an ongoing crackdown on dissent that has targeted the now-outlawed Muslim Brotherhood, which propelled Morsi to presidency in 2012, and has expanded to activists, journalists, protesters and academics. Morsi, who is already imprisoned for 20 years for inciting violence during his presidency, also faced the death penalty in the espionage case. He did not receive it in that trial but was sentenced to death Saturday with more than 100 others in a separate case involving a prison break. Prosecutors had argued that armed members of Hamas entered Egypt during the nation’s 2011 uprising and broke into several prisons, releasing thousands of inmates and freeing more than a dozen leaders of the Muslim Brotherhood, including Morsi, according to the Associated Press. The precise evidence against Shahin remains unclear, which has led many to speculate about exactly what he did to warrant the charge and prosecution. “From day one I described the events that toppled Morsi as a bloody coup,” says Shahin. A friend and colleague of Shahin, Khaled Fahmy has made supportive statements on social media since the death sentence was announced. Fahmy, a history professor at The American University in Cairo, says that Egypt’s government has been looking for a way to link Shahin to the Muslim Brotherhood because of his criticism of the government, which they have then used to label him a foreign agent of the West and Qatar. “But the intelligence services know he’s not a card-carrying member of the Brotherhood,” says Fahmy. In November 2011 someone from the Muslim Brotherhood e-mailed Shahin with others copied on the note and asked for an analysis of the political situation. Shahin has since deleted the email and his reply, but says it’s the only evidence the government has produced. “What is wrong with a political scientist giving his analysis—and how is that related to espionage?” asks Shahin. However, some believe that the e-mail, along with Shahin’s previous criticisms of the current government is enough to prove he belongs to the toppled brotherhood regime. “Emad Shahin may be a distinguished professor, but he deeply belongs to the Muslim Brotherhood. Just read his articles in which he criticized Morsi opponents,” said the Egyptian TV anchor, Yousef Al-Husseini, on his talk show last week. Fahmy says the link drawn by the e-mail is very tenuous and refutes claims that his colleague is part of the Brotherhood, which he calls “politically bankrupt.” Shahin does have more sympathy toward Islamist policies than himself, he says. “But where is the crime in that?” he asks. Amnesty International said the court recommendations to sentence defendants on Saturday to death comes after “grossly unfair trials” and shows the “deplorable state” of Egypt’s criminal justice system. “The death penalty has become the favorite tool for the Egyptian authorities to purge the political opposition,” said Said Boumedouha, deputy director of Amnesty International’s Middle East and North Africa Program, in a statement. After the decisions were announced, gunmen killed two judges and a prosecutor in the Sinai Peninsula as they were going to a court hearing, according to the Agence France-Presse. “The Presidency has complete confidence that these heinous attacks will not deter the honorable judges of Egypt from pursuing their noble mission for the country and will only increase their determination to serve justice,” the president’s office said in a statement.